"At the western end of the Cathedral, apart from the main building, as may be seen in a previous view, this beautiful and unique structure, called the Galilee, is situated. It was erected by Bishop Pudsey, in 1160, after having failed to erect a lady chapel. 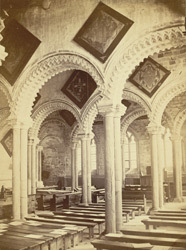 It is composed of five narrow aisles, each fifty feet long, and about sixteen wide, formed by light clustered columns, supporting semi-circular arches, and ornamented with a rich zig-zag moulding. The general effect of the arrangement of this structure is unrivalled in this country. Near the entrance is the plain monument which covers the remains of the 'Venerable Bede.'"